In 2018, Atradius Payment Practices Barometer survey respondents from Western Europe reported an increase in past due B2B invoices. 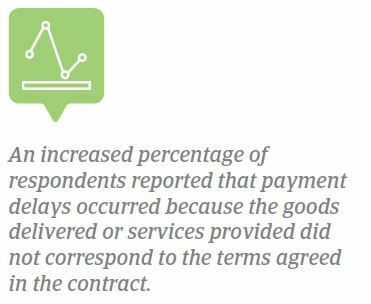 The majority of respondents (57.9%) said that they felt the impact of payment delays having to postpone their own payments to suppliers and even losing revenue. Like in 2017, the main reason for payment delays was insufficient availability of funds. 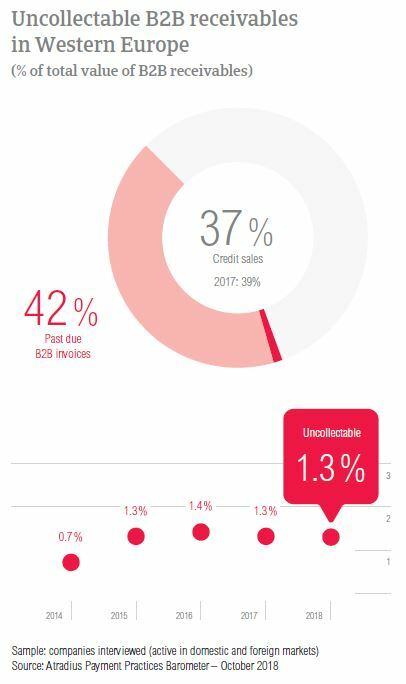 The proportion of uncollectable B2B receivables remained stable at 1.3% and most respondents in the region declared that the customer going bankrupt was the main reason for write-offs. The proportion of B2B credit sales in Western Europe decreased from an average of 38.8% in 2017 to 37.4% this year. This was mainly due to steep decreases in Ireland (by 7.2%) and Great Britain (by 6.7%). With an average of 56.2% of B2B sales transacted on credit terms, respondents in Denmark remain the most inclined to offer credit terms. In contrast, with an average of 25.0%, respondents in Germany are the least inclined (even less inclined to offer credit terms than in 2017, when the average proportion of B2B sales on credit stood at 26.5%). Respondents in the Western European countries surveyed are more likely to sell on credit terms to their domestic B2B customers than to their B2B customers abroad. Domestic credit terms seem to be granted mainly to repeat B2B customers to reward long-standing business relationships but also because this is the customers’ preference. There is also a shared belief that selling on credit can stimulate local expansion by attracting new customers. 32.3% of respondents said refusing to grant credit terms is mainly due to the poor payment behaviour of their domestic B2B customers and 20.0% said that it is due to the financial weakness of the customer. Businesses in Western Europe seem to grant trade credit to foreign B2B customers mainly for the same reasons, to nurture already established relationships and to attract new customers. Respondents said that credit sales provide flexibility and it’s much easier to use this method of payment. 33.9% of Western European respondents said that they refuse to grant credit terms to their B2B customers abroad if they lack information on their customer’s business or payment performance. Other main reasons for refusing credit sales are high economic or political risk in the customer’s country (mentioned by 26.7% of respondents) and poor payment behaviour (22.1% of respondents). We trade on credit because we would like to increase foreign trade and because we believe that this is very profitable and easy. 87.6% of respondents in Western Europe reported frequent late payments by their B2B customers compared to 87.8% in 2017. Late payments seemed to occur significantly more frequently with domestic B2B customers than with B2B customers abroad. The percentages of respondents who cited late payments by their B2B customers increased significantly in Sweden and Greece. After a minor increase from 39.0% in 2016 to 40.7% in 2017, the proportion of past due B2B receivables in Western Europe increased again this year and stands at 41.8%. The regional increase occurred after all countries with the exception of Germany, Ireland and Great Britain reported higher proportions of past due B2B invoices. The average proportion of foreign past due B2B invoices is slightly higher than that of domestic past due B2B invoices. In 2018, the average Days Sales Outstanding (DSO) figure recorded in Western Europe is stable at 44 days, showing no change compared to 2017. 62.8% of respondents in the region said that they do not foresee changes in their company’s DSO over the next 12 months. 21.0% of respondents mentioned that they expect an increase while 16.1% foresee a decrease. In Western Europe, late payments were most frequently reported in Austria (95% of respondents). This included all survey respondents (100%) regarding their domestic B2B customers. As a result, the percentage of late payments for the country increased from 91.5% in 2017. Switzerland and Belgium follow with 92.5% of respondents citing payment delays. In contrast, respondents in Greece were the least likely to report late payments (on average, 72.0% of respondents). In 2018, Great Britain continues to be the country with the highest proportion of domestic and foreign past due B2B invoices. The proportion of overdue B2B invoices is stable at 48.7% after 48.8% in 2017. The country also reported an increase of four days in DSO. After Great Britain, the country with the highest percentage of past due B2B invoices is France (on average, 47.5%). Domestic B2B customers have, on average, 34 days to fulfil their payment obligations (33 days in 2017). Foreign B2B customers are given, on average, 29 days (31 days in 2017). The average payment terms in most countries surveyed remained largely stable. Italy is the exception, where there was a five days decrease for domestic B2B customers and an eight days decrease for B2B customers abroad. Greece remains the country that offers the most lenient payment terms in the region (on average, 75 days and 29 days respectively). Respondents in Germany set the shortest payment terms (on average, 20 days and 23 days respectively). 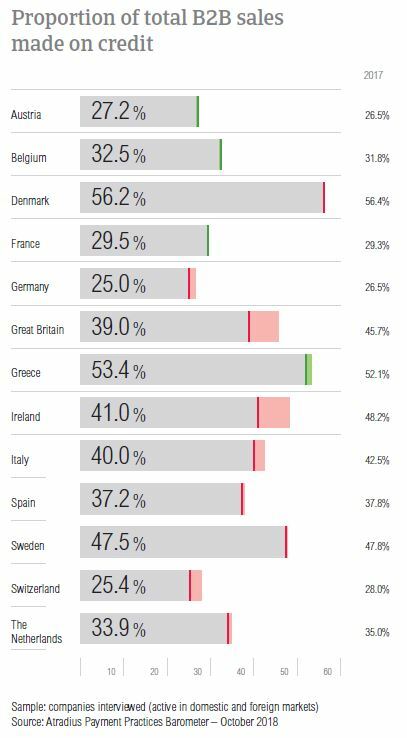 When asked if their companies differentiate payment terms between domestic and foreign B2B customers, respondents in the Netherlands, Great Britain and Germany are the least likely to differentiate and those in Italy, Spain and Greece are the most likely to differentiate payment terms. The main reasons for differentiation mentioned in all countries surveyed are internal policies and local industry practices. Other noteworthy reasons are that the economic situation in the export country is poor (mentioned mostly in Great Britain, Spain and Ireland), the financial risk related to the export transaction is high (mentioned in Greece, Ireland and Spain) and domestic payment terms dictated by law (mentioned in Great Britain, Spain and France). 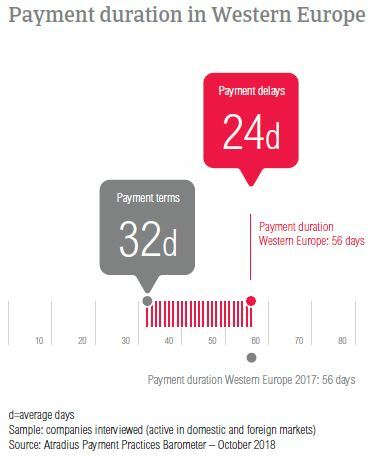 Domestic and foreign B2B customers of respondents in Western Europe delay payments, on average by 24 days. This compares to 26 days for domestic and 22 days for foreign B2B customers in 2017. In 2018, the longest payment delays occurred in Great Britain, where respondents received payments on average, 34 days late. Despite a minor increase this year, respondents in the Netherlands experienced the shortest payment delays (on average, 16 days). Sweden reported increases in payment delays by both domestic and foreign B2B customers (from an average of 12 days in 2017 to 19 days this year) while Ireland reported significant decreases (from an average of 27 days in 2017 to 19 days this year). In 2018, domestic payment delays in Western Europe occurred mainly because of insufficient availability of funds (47.3%), buyers using outstanding invoices as a form of financing (30.9%) and because the goods delivered and services provided did not correspond with what was agreed in the contract (20.0%). There was a significant increase in the percentage of respondents reporting this last payment delay factor (from 13.3% in 2017). 31.7% of respondents stated insufficient availability of funds by foreign B2B customers (34.6% in 2017). The second most frequently cited reason for payment delays by B2B customers abroad was the complexity of the payment procedure, stated by 27.3% of survey respondents; a slight decrease compared to 2017 when it was 30.7%. The majority of respondents in Western Europe (57.9%) said that payment delays affected their businesses. Of these, 18.0% had to take specific measures to correct cash flow, 16.8% reported that they lost revenue and 15.9% that they had to postpone payments to their own suppliers. 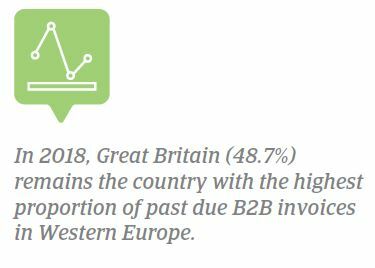 42.1% of Western European respondents said that overdue B2B invoices did not have a significant impact on their businesses. The average payment duration in Western Europe decreased is stable at 56 days in 2018. With an average of 76 days, Greece still has the longest payment duration in Western Europe despite this year’s decrease of eight days. In contrast, the payment duration of Germany and the Netherlands averages 42 days and is the shortest in the region. In 2018, the payment duration recorded in France and Sweden deteriorated (6 days increase in France and 5 days increase in Sweden). 67.4% of respondents in Western Europe said that they are already invoicing their B2B customers electronically (e-invoicing). By country, e-invoicing appears to be most broadly used in Denmark (79.3% of respondents), Ireland (78.9%) and Sweden (75.1%). At the other end of the scale, with a percentage of 43.0%, respondents in Greece are the least likely to invoice online. Italy, where 63.0% of respondents are currently invoicing online, had the highest percentage of respondents (23.2%) who stated their willingness to adopt e-invoicing in 2018. 53.8% of respondents in the region said that e-invoicing has resulted in quicker payment from their B2B customers. 41.0% said that e-invoicing had no noteworthy effect and a low 5.2% said that it caused a slowdown in payment. The outlook for almost all Western European countries is positive. However, there are a number of potential threats to global growth. Survey respondents ranked four of the most notable risks to global economic growth: US protectionism escalating into a trade war, US Fed policy, a ‘hard landing’ in China and geopolitical risk. 44.8% said that US protectionism turning into a trade war is the most likely to dampen economic growth in the upcoming six months. 25.4%, of respondents in the region believe that US protectionism is a significant risk but is not the most significant one. Only 14.5% of respondents believe this is the least significant risk. By country, the highest percentage of respondents believing that US protectionism may trigger a global trade war that hampers global growth was recorded in Denmark (59.6%). According to our survey findings, the second most significant risk to global growth is geopolitical risk (19.6% of respondents mentioned this). Businesses trading internationally do not seem as concerned about the US Fed policy or a potential ‘hard landing’ in China. These were considered to be the most significant risks to global economic growth by 19.3% and 16.3% of respondents respectively. 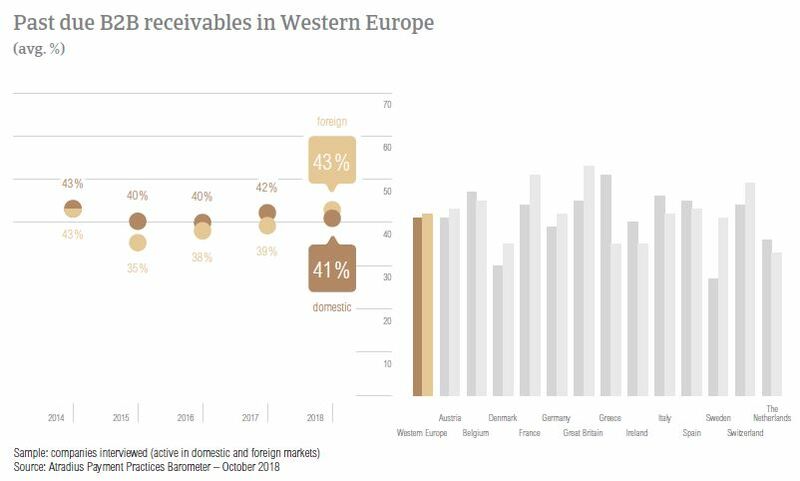 The average proportion of uncollectable B2B receivables in Western Europe is stable at 1.3% (no change in 2018). With the exception of Greece and Denmark uncollectable B2B receivables in the region averaged between 0.7% and 1.5%. Germany and the Netherlands had the lowest percentages of uncollectable B2B receivables (on average, 0.7% and 0.8% respectively). Greece continues to be the country with the highest percentage of uncollectable B2B receivables. Moreover, the country also experienced a small increase, from an average of 2.5% in 2017 to 2.8% this year. Uncollectable receivables in Western Europe originated most often from the construction, consumer durables, business services and services sectors. B2B receivables were reported to be uncollectable mainly because the customer went bankrupt or out of business. This view was shared by the majority of respondents in Western Europe (57.1%, slightly down from 58.3% in 2017). Secondary reasons were the failure of collection attempts (cited by 28.4% of respondents) and the additional, high costs to pursue the debtors (cited by 27.8% of respondents). In 2018, respondents in Western Europe gave their customers 27 days, on average, to pay invoices. 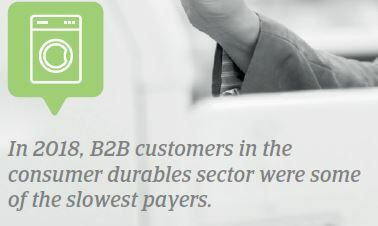 By sector, B2B customers of respondents in the paper (on average, 50 days) and textiles sectors (42 days on average) were given the most lenient payment terms. In contrast, B2B customers in the business services sector had the shortest time to fulfil their payment obligations (on average, 26 days). B2B customers of respondents in the construction materials and consumer durables sectors seem to take the longest to pay. Domestic and foreign B2B customers in these sectors paid, on average, 31 and 27 days late. Similarly to what was stated for the region overall, the main reasons for payment delays were insufficient availability of funds and buyers using outstanding invoices as a form of financing. Looking at changes over the coming 12 months, 38.0% of respondents in construction materials do not expect any changes in the payment behaviour of their B2B customers. A slightly lower percentage, 34.0% expect deterioration. Most respondents in the consumer durables (54.0%) sector do not foresee changes while 25.0% foresee deterioration.